In the previous posts we talked about the transport extension that scaling-out our WCF services over a message bus transportation. What we have done is to use request reply MEP as a example, and implement the asynchronous methods that makes our transport support the normal WCF usage – ServiceHost and ChannelFactory on service hosting and client invoking. Request reply MEP is the most common mode when we are using WCF, but there are two MEPs available in WCF as well: datagram and duplex. In this post I will demonstrate how to implement the datagram MEP in our solution, with some code refectoring. Datagram MEP, also known as the one-way, request-forget or fire-forget MEP. Different from the request reply, in this mode the client will send the request to the server and no need to wait for the reply. This means, on one hand, the client will not be blocked by the server reply. On the other hand, the client will neither know if the server received the message, nor the service works properly. This MEP is widely used in scenario like logging, auditing, etc..
On the client side, the OutputChannel will send the request message to the underlying transportation, while on the server side, the InputChannel will receive them and dispatched by WCF to the service class and related method. The OutputChannel just sends the message to the message bus, in our case, and will not wait for any response. It will return back immediately. And the InputChannel on the server will receive the message and process the business logic without sending back any reply. Client side, implement a ChannelFactory that returns an OutputChannel, and implement the OutputChannel which can send message to the bus. Server side, implement a ChannelListener that returns an InputChannel, and implement the InputChannel which can receive message from the bus. Since we had created a ChannelFactory and ChannelListener for the request-reply mode, and the channels works well with our message bus before, then we will do some code refactoring first. We will have three base classes that covers some common procedures for channels, channel factories and channel listeners. The channel base class will just receive the buffer manager, encoder factory and provide them as a protected readonly properties. We will also have a property named ChannelID, which will be used in the duplex MEP in the next post. In the request channel and reply channel we have a lot of code that convert the WCF message into string and vice versa, which using the buffer manager and encoder. Here we will create two methods for them so that in the future the channels can convert between string and message by just invoking them. 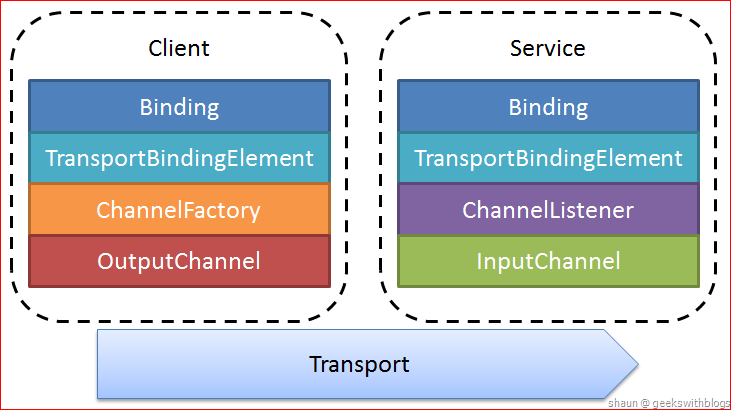 The main responsibility of the channel factory and channel listener is to create a related channel object. Each factories and listeners will has very similar logic, except which type of the channel it will create. So we can have two base classes to wrap almost all complexity and just let the sub classes to take the responsible to create the actual channel object. As you can see, the ChannelFactoryBase and the ChannelListenerBase I just expose an abstract method which is CreateChannel, that gives a chance to the sub class to instant the actual channel object. After these modification our request and reply part (that had been done in the previous post) could be turned simpler and clearer. The RequestChannelFactory will be like this. And this is the ReplyChannelListener. And below is the RequestChannel and ReplyChannel. I inherited them from the MessageBusChannelBase class and utilized the helper methods to convert between string and message. Also a little bit changes could be made in the RequestContext as well, which utilizes the message convert methods as well. After the refactoring it would be easier to create the channel factory, listener and channels for datagram MEP. First we will create the client side OutputChannelFactory, which just need to implement the CreateChannel from its base class (ChannelFactoryBase) and instant an IOutputChannel object. The MessageBusOutputChannel class we are going to create will be inherited from the MessageBusChannelBase as well, and will implement the IOutputChannel interface. There’s only one important method we should implement which is Send. This method will be invoked when the client send the message to the server to do something. You will notice that this method doesn’t have any return value, which means, as the datagram MEP defined, the client should not care about whether the service will process its message. Since we have had the convert method in the channel base class, we can simply convert the message into string and pass it to the underlying message bus. On the server side, similarly we need to create the ChannelListener from the base class and just need to implement the code to create the relevant InputChannel instance. The InputChannel need to receive the message sent from the client (InputChannel), by its BeginTryReceive, EndTryReceive, BeginReceive and EndReceive methods. We will also create two delegates for them and use the asynchronous invoke methods. You might notice that we defined a virtual method named OnTryRecevie and invoked it after the delegate got a valid incoming message, but without doing anything. This method will be used in the future in session implement. You can ignore it for now. Last thing we need to do is to update the transport binding element, which will make our transport support the InputChannel and OutputChannel, and return the related ChannelFactory and ChannelListener. Now let’s test our datagram operation. Open the test console project and create a new service contract with one method which has the IsOneWay = true defined. And update the console main function as well. Again, I’m using the in process message bus so the multi-instances service will be hosted on threads instead of processes and machines. When we invoked the service many times we can see the datagram message send across to the three services. IsOneWay = ture Always Means Input-Output Channel? Let’s modified our test service contract and service implementation a little bit, and to see what happen. Let’s add another method in the contract with the IsOneWay = false, as well as the implementation class. 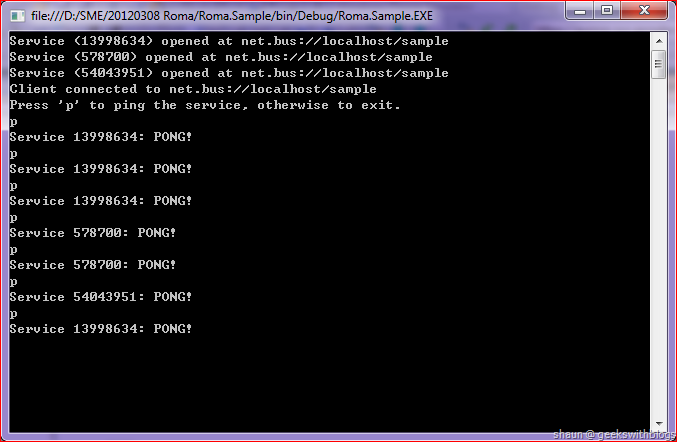 And then F5 our console application and try to invoke the Ping method. Now we found that the client sent the request, but the service method was not invoked and our client was dead. More interesting, if we debugged the code we will find that when we invoked the Ping service method which is IsOneWay = true, the WCF tried to create a RequestChannel and ReplyChannel to us. Why I invoked a service method with IsOneWay = true, but the WCF gave me a request and reply Channel? Well the channel the WCF chose is NOT based on the method you are invoking, it is based on the contract definition. The channel selection logic is complex but to be simple, WCF will select the channels which just satisfied with the requirement of your service contract. Kenny Wolf have a nice post that roughly summarized this logic. In our case, we have a method marked IsOneWay = true and another marked IsOneWay = false. So the WCF will chose the request reply channels even though we are using the method that IsOneWay = true. The problem is that, when using request reply channel handles the datagram message, the reply message from WCF will always be null. This will cause the exception in our RequestContext.Reply method, since we need to send the reply message back to the client but now it’s null. Thanks Jiang Jinnan, who helped me a lot to figure this problem out and the solution suggestion. For more information about this WCF MVP you can visit his blog (in Chinese). When we knew the root caution, the solution would be very simple. In the RequestContext.Reply method we will check if the message is null. If yes, that means this is a datagram channel shape and we need to send a blank message back to the client to acknowledge and make sure the process is running. And in the RequestChannel.Request we also need to check whether the reply message content is blank. If yes we will do nothing since we know that this is a datagram channel acknowledge message from the server side. 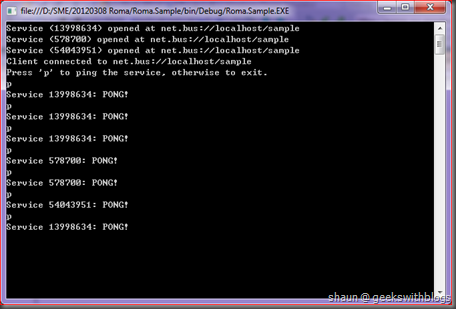 Now let’s execute our test console you can see the IsOneWay = ture method was invoked correctly. In this post I implemented the datagram MEP channel factory, listener and the related input output channels. I also explained a potential problem if we have IsOneWay = true methods and IsOneWay = false methods mixed in one service contract, and how to solve it. We have finished two MEPs in our transport extension, request reply and datagram. And both of them supports the service side scaling-out, as you can see our request can be handled by multiple services, based on the pulling approach. In the next post I will demonstrate the most complexity and difficulty part, the duplex mode. I will implement the duplex channels over our message bus infrastructure with the server side scalability and sticky to the same client instance as well.